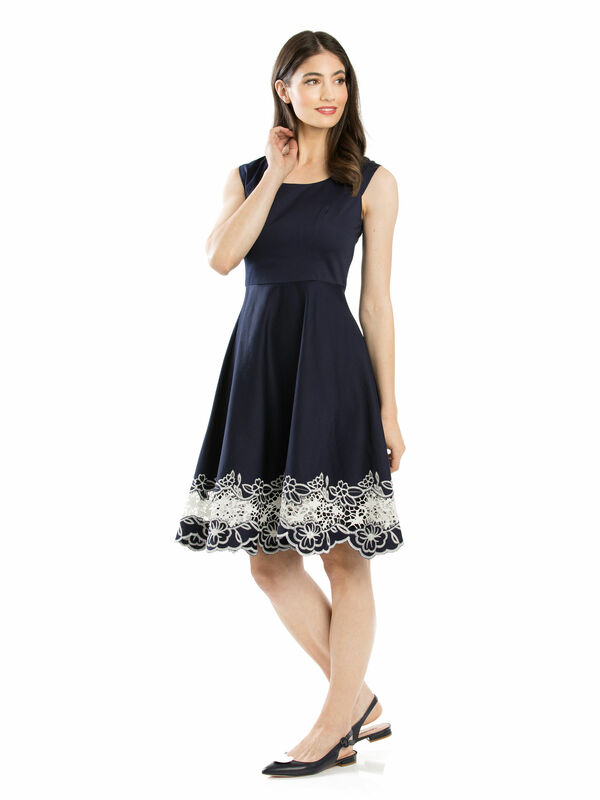 Cut It Out Dress https://www.review-australia.com/au/cut-it-out-dress-navy/RE19DR059.RENVY009.html Here's to a new navy and white delight! The Cut It Out Dress is made from soft cotton to keep you cool this summer. 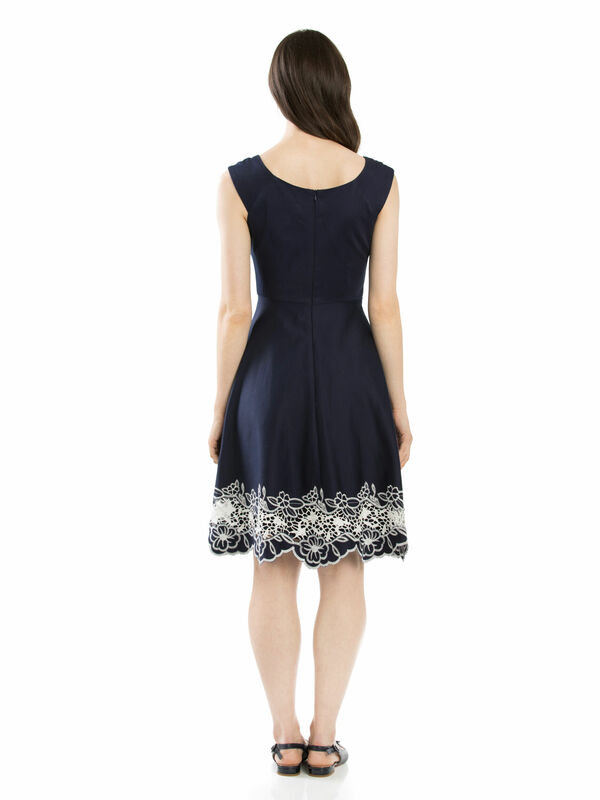 Feminine lace and embroidery give this dress a recognizably Review flair. Pair with a white cardi for a fabulous summer ensemble. Cut It Out Dress is rated 4.9 out of 5 by 51. Rated 5 out of 5 by Sammylee from Great dress I have purchased this dress for my sisters upcoming wedding. I was going to go with a long dress but when I saw this in the store it completely changed my mind about having a long dress. I love the detail at the bottom of the dress. I have always loved and still love review dresses, so when an event comes up I will alway see what review dress I can buy to wear to that event. The dress are so comfort and well made and the material is so nice. Rated 5 out of 5 by Commutergirl from It’s a great fit. 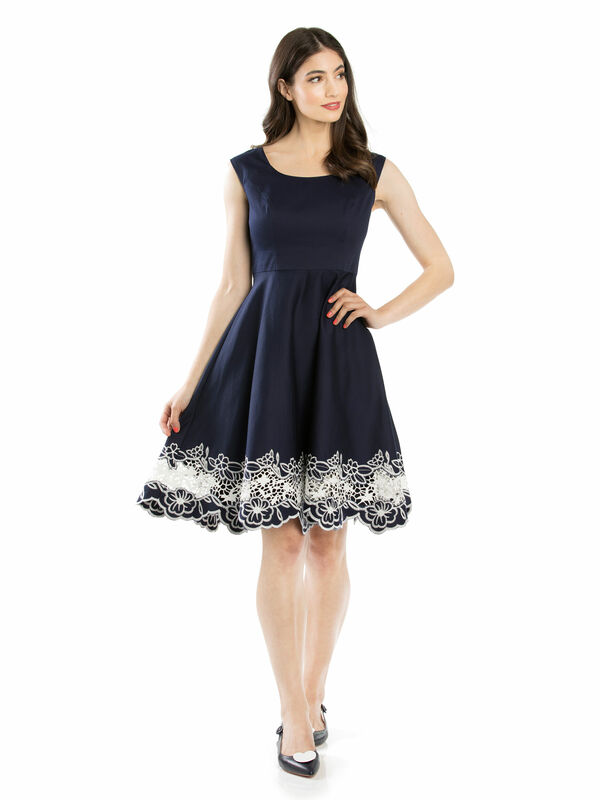 I bought this dress two weeks ago to wear at a Cocktail party and for a wedding in March. I loved the neckline and unlike other waisted dresses there’s a bit of give in the waist. The cut out lace around the hem is very pretty however, ladies, beware of other women with swinging handbags because my hem got caught in the chain of a handbag that went swinging past me. I now have a small tear to repair in the lace. Rated 5 out of 5 by Saraf from So comfy and flattering Love love love this dress, so comfy and flattering. I get complements every time I wear it! Rated 5 out of 5 by Gibbsy86 from Beautiful Dress I love this dress. I bought it as a versatile dress for going out in either during the day or at night. I will need to be mindful of the white detail at the bottom as it could very easily get caught on something. What I love about the detail is it’s still very modest despite being able to see through it which - depending on the people and circumstance (for me) - is important. Rated 5 out of 5 by KitKat28 from Oh so flattering My partner brought me this dress for my birthday and he even helped pick it. 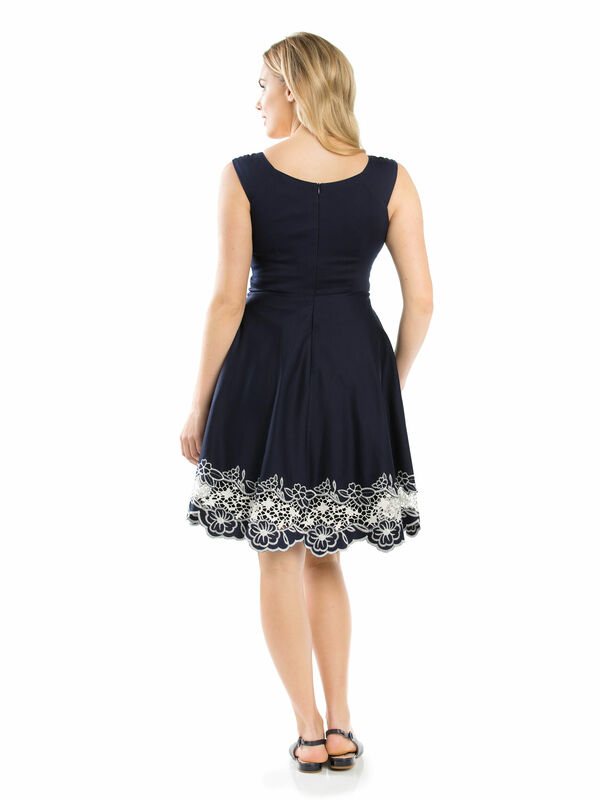 I absolutely love the dress it's so flattering, comfortable and perfect for all occasions. Will be wearing it to an engagement party this month as well. I feel amazing when I wear this dress and it even hides the food baby after a big birthday dinner. Can't wait to wear it over and over again!!! Rated 5 out of 5 by Pink Sue from Absolutely stunning! I fell in love with this dress the moment I tried it on. It’s classy and so, so feminine. The fabric is soft and textured, the cut beautiful and it feels amazing to wear. I wear it with my white bow belt which picks up the intricate cut out design. I have received lots of compliments wearing my Cut It Out Dress and it’s my favourite item in my wardrobe. Rated 5 out of 5 by Fofi from Comfortable to wear. It looked elegant on. I bought the dress a week ago. For my grandsons Baptism. I wore it 2 days later at my Christmas luncheon. Where I was told that my dress is beautiful on several occasions through the day and was asked about the label. I would say I made the perfect choice for myself.